Mac and cheese. It’s one of those kids foods that never fails to please. But, how can we make it healthier? Basically, by not making the one that comes in a box. Although the producers make claims about it being healthier than before, it’s still shelf life food and that can’t be good. 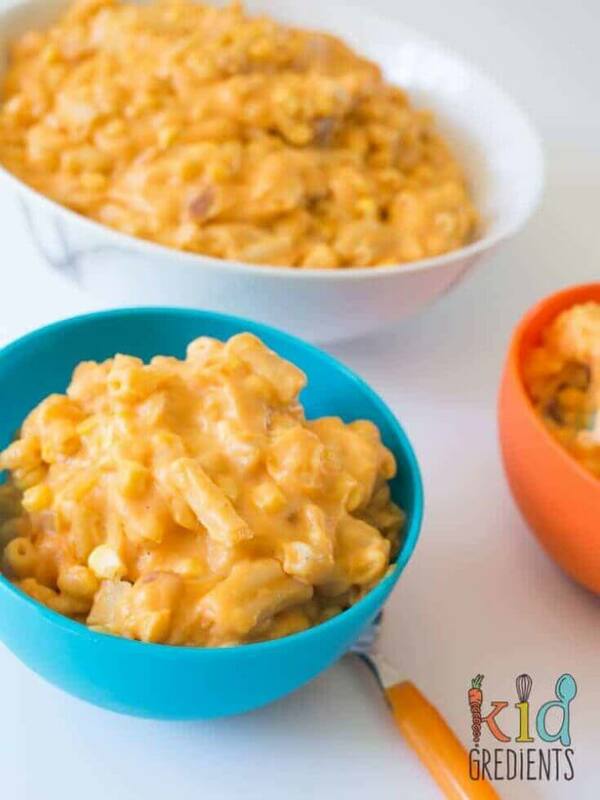 This sweet potato macaroni and cheese is much healthier! 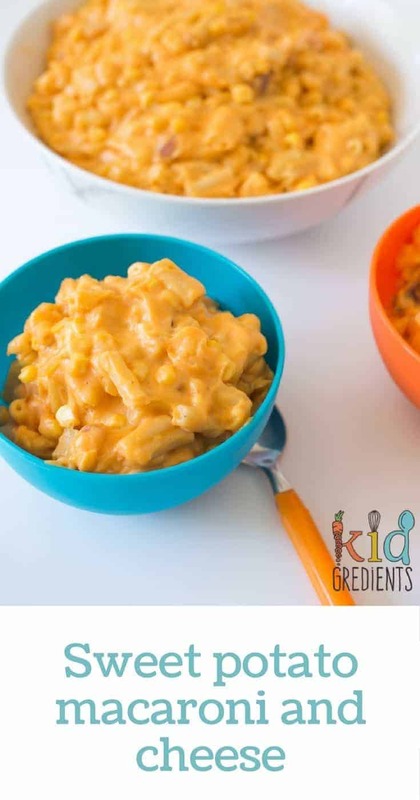 If your kids love the look of packaged mac and cheese, then this is the perfect way to get the same colour! If they haven’t ever had it (mine haven’t) then they’ll just fall in love with the sweet flavour of the cheesy sauce and stand at the bowl eating it when Mummy leaves the room for a second whilst taking the photos….oops…maybe that’s just my son. I made this to have for dinner, but the problem was, he ate a whole bowl for second lunch…lol so I had to rethink my plans and I’ve kept it in the fridge for the next night. 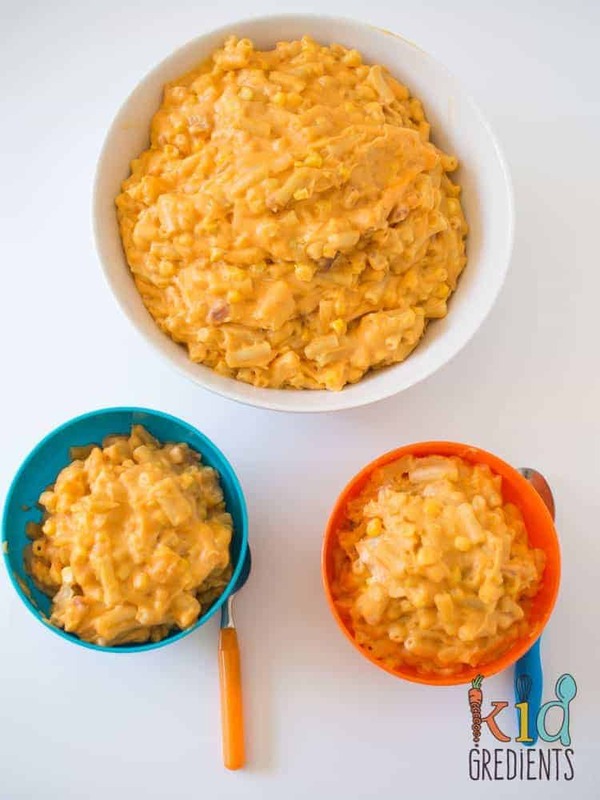 Which is a great thing about this dish, not only does this sweet potato macaroni and cheese freeze well (it’s the sweet potato that helps with this as cheese sauce is notorious for splitting after freezing), it also reheats really well! If you’re looking to please the whole family, this is the perfect meal, with the bacon, and onion well and truly mixed through, and the sweetness of the sweet potato, there’s a lot of appeal in this pasta. I think even hardened mac and cheese lovers will like this healthier version. If you’re not keen on bacon, then skip it, otherwise, the extra bit of saltiness that it adds to the dish is fabulous! If you want to add in extra veggies, then this is the perfect dish for that too, grated zucchini or carrot would be perfect, or even some sliced mushrooms, cauliflower or broccoli florets would work really well! 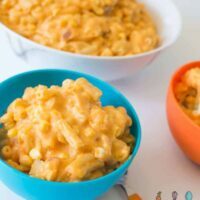 If you’re looking for more veggies in your mac and cheese, check out this version from Stacey at My Kids Lick the Bowl. Because it reheats so well, you could make this at lunchtime for times when the evenings are crazy and just reheat at dinner, making the perfect super quick meal, great for when there’s after school activities and other stuff to contend with. 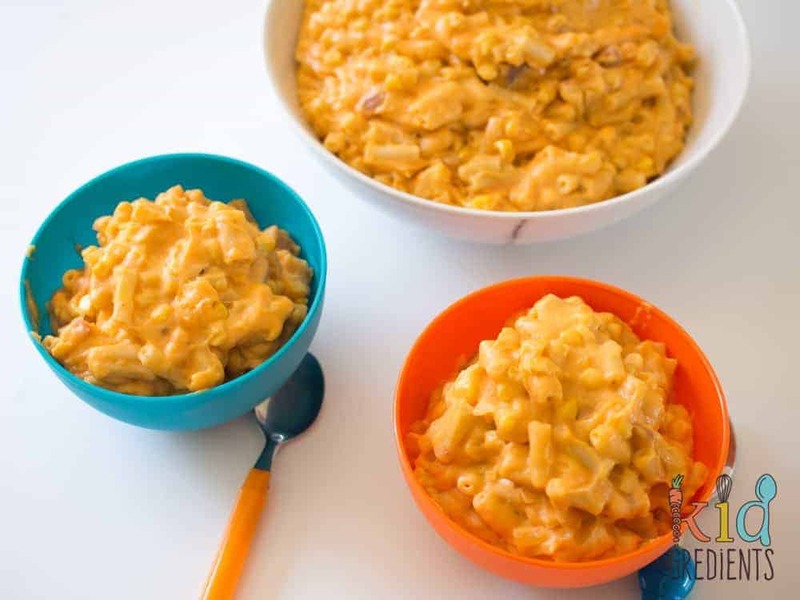 A delicious take on macaroni and cheese that even looks orange! This is a healthy version made with sweet potato! Steam the sweet potato chunks until soft. (To make less mess: set up the steamer over the pasta pot and steam the sweet potato- makes one less pot!). Allow to cool then puree in a blender, food processor or with a stick mixer. Whilst it is cooking, combine the onion and bacon in a saucepan and fry until the onion is soft. Add the corn and cook 4 mins more. Add the butter to the saucepan over medium heat. When it is frothy, add the flour, stirring quickly. Start adding the milk, a bit at a time until it is all incorporated. Bring to the boil, then drop in the cheese, stirring quickly to spread it through the sauce. Add the pureed sweet potato, corns, bacon and onion mix and the cheesey sauce to the pasta pot and mix. You can freeze this in individual containers to have another night! You are so cleaver. Sweet potatoes in Mac & Cheese. Get out of town. A delight for kids, a victory for moms. YOU HAVE MADE MY DAY AGAIN!!! OMG I am totally trying this – this weekend! Brilliance! Enjoy! I am looking forward to hearing what you think!